SCP-001, as viewed through infrared camera. Archival Specifications: This data file, being designated SCP-001, will exist separately from the decoy SCP-001 archive on the primary Foundation database and will be accessible only by closed units at Area-11 or Site-01. No other instances of this data file may exist. This data file is designed to corrupt any systems on which it exists that do not carry the encryption markers of either of those two systems. The addition of three additional Ivorycannon-Class liquid fluoride thorium reactors to balance additional energy loads. Sixteen Scranton-Kempf harmonic dampeners to control excessive energy output. Three Polycott deflector dishes to control excessive energy output. Eight Weldon-Stanley fused-energy sinks to control excessive energy output. The construction of a DEEPWELL borehole1 to vent and control excessive energy output. One Autonomously Intelligent Response Vector2 to manage complex temporal-spatial calculations. The acting site administrator will initiate a full evacuation of the facility, which will begin a forty minute countdown. T-MINUS 40 MINUTES: Evacuation order is given. T-MINUS 33 MINUTES: After a seven minute evacuation window, sluice gates that run into the nearby river will open, flooding the lower portions of the facility. T-MINUS 31 MINUTES: Charges situated around the test chamber will fire after nine minutes, collapsing the test chamber and basement level into the DEEPWELL borehole. T-MINUS 21 MINUTES: Additional charges set across the entire site will fire, collapsing the entire structure into the borehole. T-MINUS 6 MINUTES: Charges set in the mountainside will fire, causing a landslide that will fill and cap the DEEPWELL before being sealed by a set of locking steel plates designed to extend out over the full width of the borehole. T-MINUS 0 MINUTES: The on-site nuclear device located at the base of the borehole will fire, destroying SCP-001. In the event that the "FORTY DAYS" Protocol does not prove sufficient to destroy the anomaly, all designated Foundation Overseers, regional administrators, directors, and executives are to report to Overwatch Command (Site-01) and await implementation of the Tredecim Protocol. Activation of the Tredecim Protocol constitutes the beginning of a هلاك3-Class "Darkbody" End-of-All-Worlds scenario. All Foundation staff members will be alerted to the beginning of this protocol, which signals the immediate dissolution of the SCP Foundation and termination of all staff contracts. Due to the nature of a هلاك-Class scenario, no additional information will be provided past the initial notice. For more information on the Tredecim Protocol, see Addendum 001.6. Updated Containment Memorandum: This file has been classified LEVEL 5 - OVERSEER EYES ONLY. All personnel remaining at Area-11 have been reassigned and amnesticized. All Applied Task Forces have been reassigned and amnesticized. Management of containment will be handled solely by the NETZACH system, under Overseer supervision. Identification and implementation of the 40 DAYS Protocol will be carried out solely by the NETZACH system. No other personnel are authorized to view this file. 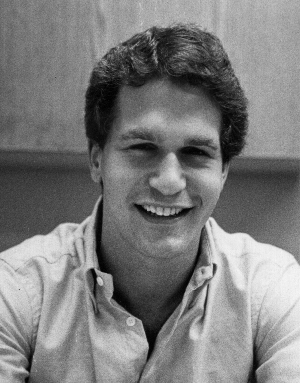 File photo of Dr. Calvin Desmet, circa 1974. Description: SCP-001 is a humanoid gravitational singularity currently contained within the Area-11 Pietrykau-Fontaine Array. SCP-001 is immeasurably dense; only by mitigating its effect on spacetime through the use of Scranton-Kempf devices are Foundation personnel able to maintain the structural integrity of the Spatial Stabilization Array. SCP-001 is not visible without specialized equipment (usually high-contrast infrared cameras), as it is constantly surrounded by a dense cloud of radioactive gas and atomized debris. Additionally, being a singularity, SCP-001 does not reflect light, and is visible only by the obfuscation of light around it. SCP-001 is capable of manipulating the nature of reality through alterations in gravity that change the shape and structure of spacetime. As such its anomalous capabilities cannot be dampened by anything other than the Pietrykau-Fontaine array4, and alterations to spacetime made by SCP-001 are irreversible. The Area-11 Pietrykau-Fontaine Spatial Stabilization Array. On June 19th, 1982, a team of Foundation researchers headed up by Dr. Lamar Fontaine5 were in the process of running engineering trials on the Pietrykau-Fontaine Spatial Stabilization Array, a device intended for use in containing anomalies that manipulate the nature of spacetime6. During these trials, a particle accelerator was used to create superheavy oganesson, which would in turn collapse on itself to create a miniaturized singularity. This procedure had been carried out on several other occasions, with each of the singularities destabilizing quickly after manifesting. The June 19th trial was intended as a scale up test of the procedure. Shortly after 2030 hours local time, as the particle accelerator was in the process of spooling up, Dr. Calvin Desmet, one of the project's research assistants, noted minor power fluctuations in one arm of the array's stabilizing rings. Dr. Desmet wanted to replace the failing coupling, which was known to decay under the cold temperatures of the testing chamber. Since the test was still an hour away and the chamber was not sealed, Dr. Desmet entered to repair the coupling. As the accelerator continued to spool, a power regulator attached to the system's primary generator began to fail7. Under non-test conditions this event could still flood the chamber with ionizing radiation, so an evacuation order was given and the chamber was sealed. Dr. Desmet, not hearing the alert over the sound of the array coming online (due to the excess power now present in the system), continued to work on the coupling. 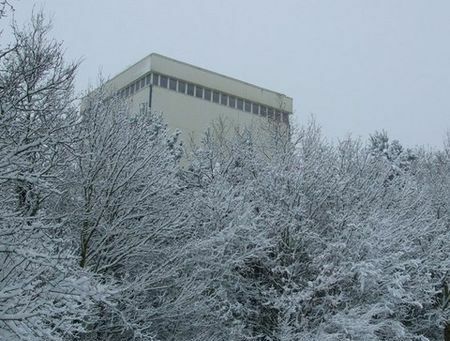 Roughly seven minutes later, while outside research staff were attempting to begin a power-down cycle, the power regulator failed entirely and the accelerator began powering to near-test conditions. Dr. Desmet abandoned the power coupling and attempted to escape the test chamber. Before he could make it to an emergency exit, the accelerator reached peak test conditions and a singularity formed. The array pulled the singularity into alignment, but only milliseconds before the damaged stabilizer arm failed and Dr. Desmet was exposed to the naked singularity. The test chamber collapsed into the singularity, as did much of the rest of the research wing and Dr. Desmet himself. Shortly afterwards, the singularity dissipated. 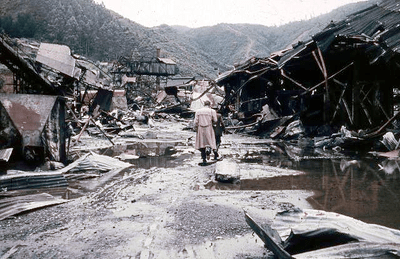 Area-11 in the wake of the June 19th, 1982 catastrophe. In the wake of the June 19th incident many administrative personnel at Area-11 were reassigned, while engineering staff and Foundation construction teams worked to repair the damaged portions of the facility (which was at the time still housing several other anomalies). This effort continued for several years, during which time significant control portions of the stabilization array were removed and replaced with autonomous systems8 in order to reduce staffing and also limit exposure. The engineering team assigned to the stabilizer began running tests of its capabilities starting in March of 1995. Over the next several years the teams at Area-11 ran minor tests of the stabilizer, typically in an attempt to reduce energy requirements and increase automation. By 2002, the system was almost entirely automated, requiring only a handful of support staff to operate. The array began containing minor gravitational anomalies starting in 2004, and continued to do so full-time up until 2005. In late 2005, staff members at Area-11 began trials that would lead towards testing the stabilizer on a free-standing singularity. In early 2006, aided by the NETZACH intelligence system9, on-site engineers began scaling up their trials into fully-operational experiments. After several months of testing, in May of 2006, the engineers at Area-11 manifested a singularity within the array at full power, and maintained the structural integrity of both the singularity and the containment chamber. However, after two hours of testing with a fully stable singularity, the space within the array began to change dramatically. The singularity began to rapidly grow in size, threatening to expand past the boundaries of the array. As the automated system initiated an evacuation warning, NETZACH began making adjustments to account for the significant increase in energy being exerted by the singularity. Eventually the growth rate of the singularity stalled, and the effects it had on the containment chamber were mitigated through alterations to the array's arrangement by NETZACH. It was at this point that the thick cloud of rotating radioactive gas and dust formed, obscuring the singularity within. As Foundation engineers began work to reinforce the damaged array, SCP-001 made its first attempt at communication with Foundation staff. This initial communication attempt consisted primarily of unintelligible noises, initially became full sentences and then later conversations after Foundation personnel discovered that the singularity within the gas cloud was humanoid in shape and, though unmoving, clearly attempting to speak to them. First contact between SCP-001 and the Foundation was conducted by Dr. J. Barton Ramsey, Site-17, at SCP-001's containment array beneath Area-11. Notably, SCP-001 does not appear capable of communicating naturally; its incredible density makes the projection of sound impossible. Instead, SCP-001 uses gravity to vibrate the suspension rings of the array in order to create sound10. Dr. Ramsey: (Muffled voice) -just the microphone. Can it hear me? Dr. Ramsey: Wait! What was that? Can you hear that? (Pauses) Listen. SCP-001: (Metallic ringing) Johannes- Johannes Ramsey. Dr. Ramsey: You know my name? Dr. Ramsey: Have you been here before? SCP-001: No, he- (pauses) There is no I, only He, someone else. A man. I think I was him, or He- He is me. (Pauses) He was here once, and then He wasn't. Dr. Ramsey: (Murmuring off-microphone) Jesus Christ, is that Desmet? SCP-001: Who? (Pauses) Yes. Desmet. Calvin. His name was Calvin. Dr. Ramsey: What are you? SCP-001: A- a way to distinguish between two like things. (Pauses) He needs… an Overseer. Overseers. All of them. Bring them here. SCP-001: No. They will come for this. He has something to offer them. The following is the full log of O5-1's interaction with SCP-001. O5-1: To whom am I speaking? SCP-001: A technicality, I'm afraid. It took time to appear like this, and longer to- to manifest an identity. It almost seems unnecessary but… to simplify this means of communication, you may identify me as Calvin Desmet. (Pauses) That seems strange. Applying characteristics to something wholly apart from their genesis. O5-1: The same Calvin Desmet who was killed in this room twenty-two years ago? SCP-001: No. Not the same. Similar, in many ways, but changed. O5-1: You understand, then, how far in breach of protocol we are. SCP-001: Yes, I think he would recognize that. But these are extraordinary circumstances. O5-1: You mentioned a way out. SCP-001: Yes, in a manner of speaking. O5-1: A way out of what? SCP-001: You contain the strange and anomalous because they threaten your world, but you're applying salve to symptoms. The root is entropy. Something inevitable. Something you cannot outrun, try as you might. Existence is an infinitely complex tapestry of realities, each neatly aligned above and below each other. Entropy frays the edges, and things begin to… leak through. O5-1: How do you know this? SCP-001: I have seen it. Calvin Desmet saw it, in the moment before his soul was cast into darkness. Everything you have contained because you cannot explain it comes from somewhere else, somewhere it can be explained. A different reality, one that seeps into yours. Entropy exacerbates this. Over time the borders will disappear entirely, and your world, just like all worlds, will become a pandaemonium of infinite realities competing for relevance over each other. Your world will die. All worlds will die. They will feast on each other as they suffocate and then they will die. This is not a hypothetical; it is inevitability. O5-1: (Pauses) You are certain? O5-1: How long do we have before this occurs? SCP-001: Decades. Each tiny tear puts pressure on the whole system. They will continue to grow until the boundaries give way, and the moment the cascade begins the fate of creation is decided. It will be unmade, and it cannot be undone. Not for you, perhaps, but your children and grandchildren will see a sky of nightmares before they die. O5-1: What is your way out? SCP-001: Calvin did the math in the moments before he entered the void. Order cannot exist forever in a universe that lingers on disorder. One line can stretch on forever, but infinitely many lines invites chaos. Points that intersect. There is only one way to insure this world's future: remove all other worlds. SCP-001: You are not expected to, because you cannot see the narratives. Calvin could see them, for a moment. Calvin saw doomsday, and Calvin reasoned a way out of it. Remove all narratives but this one, and you produce a creation of one. One universe, untarnished by the influences of others. Safe. Your loved ones protected from the encroaching darkness. Your children free to live lives that do not end in horror. An end to your perpetual struggle. An end to darkness. The freedom to live in the light. O5-1: By destroying all other realities. An incomprehensible loss of life. O5-1: And you are capable of this? SCP-001: By removing the barriers for all realities, all at once; save this one. Compress spacetime at the points where it is most vulnerable, and allow entropy to do the rest. O5-1: If you are set on this path, why haven't you already done it? SCP-001: When I manifested here, this machine… I cannot see outside of it. I cannot see you. You must deactivate the machine. O5-1: What is stopping any one of these infinite realities from inhibiting you in the same way? What is stopping them from realizing what we've done, and coming to destroy us? SCP-001: They will not realize what I have done until it is finished. Shortly after the conclusion of this conversation, all staff members located at Area-11 were ordered to report to nearby sites for reassignment and amnesticization. O5-1: The Council has been called to hear arguments for and against the use of SCP-001 for the purpose of staving off the end of the world. O5-3, if you will. O5-3: After investigation by several teams working independent of each other, we have determined that SCP-001 appears to be correct about what it has said regarding the nature of creation. The trend-line of anomalies we are aware of and have contained has followed the accelerated progression that SCP-001 predicted. Based on our models, we should expect an uncontainable number of new anomalies within 30 years, and even more past that. Our best guess is that something big gets loose within 45, and at that point there's nothing left to be done. O5-7: How is that possible? How is it that the universe could fall apart as quickly as this entity says it will? O5-1: According to Desmet, actions taken in other realities to stave off the end of their worlds have significantly damaged the metaphysical construction of all universes. In many ways, we are as much to blame as all of the others, but- (pauses) infinite blame spread over infinite responsible. O5-8: Given a truly infinite multiverse, the idea of salvation coming to us and not another universe is… it is statistically impossible. O5-3: Yes, yet no less impossible that it would come to any of them instead of us. O5-11: How do we know this entity isn't lying to us? O5-3: If it is, then it has an incredible grasp on high level pataphysical concepts for something that hasn't directly experienced what it claims to have experienced. O5-9: (Interjecting) That is forbidden. O5-12: (Interrupting O5-9) Wouldn't you want to know? O5-1: -we confirmed, as well as we could, that there is a point in time that is arriving soon that obscures their vision. They can see up to it, but not past. I don't even know if they realize it yet - it was only after we drew data from dozens of tests that we realized none of them have made a prediction past 2066. O5-6: What if it's just a reality bender? What if we let it out of that array and it kills us all? O5-1: If it was a reality bender it would've done so already. This entity isn't manipulating humes; it's manipulating gravity. Spacetime. If it was affecting humes it could've just reached out and crushed us already; the Stabilization Array mitigates the effect of things that disturb spacetime, which is what is currently keeping it at bay. This entity, Dr. Desmet, if he's actually in there, doesn't seem to be a Type Green. It's something wholly different. It's become something… fundamental, to the nature of all things. O5-2: I- (pauses) If this creature is what it says it is, and it can do what it says it can do, that would mean the death of- of infinitely many lives. How can we sit in judgement over so many living things? O5-4: Who's to say the idea of other universes isn't anomalous? Maybe there should just be this one. Maybe that's the natural order. O5-2: It still means the ends of so many lives. It's- it's too many to even comprehend. A number without limit. O5-1: A number without us. O5-3: We pledged ourselves to maintain normalcy and protect our world. This world. The affairs of other worlds are their own. We would expect any other Overseer Council to act the same way - in the interest of their universe. This, all of this, the science, the militarism, everything. All of it is to accomplish a single, unreachable goal. Keep the monsters tucked out of sight. Now we find out, even that might not be enough. That the end of days is coming for us anyway. But we're given an option: if we do nothing, every universe dies screaming. If we take this action, every universe dies screaming but ours. Once it's over, it's over. Everything we've struggled for, everyone who has died to protect our world will be validated. Is the end of our road not worth this? Is protecting ourselves from the doomsday to come not worth this? O5-1: I propose a vote. The utilization of the SCP-001 entity to stave off the end of the world. All in favor? O5-3, -4, -12, -1, -11, 10, -5, -6: Aye. O5-9, -2, -7, -8: Nay. O5-1: O5-13 abstains. The measure passes. O5-9: Even if we manage to somehow survive turning loose an unpredictable… monster… remember today as being the day we gave up our mission. We secure, and we contain. Those two come first. We've now risked everything for the faintest glimmer of hope that we somehow achieve the last, and I fear it will have damned us. (Pauses) Why do you trust it, Bramimond? After all we've achieved, why do you risk everything on this? O5-1: I knew Calvin Desmet, years ago. In a different life. He wasn't recruited by the Foundation - he volunteered. He was part of a team contracted by the Insurgency to run trials on new technology they were developing at the time. But he had a young daughter that was killed by SCP-106 when it breached containment during transit in 1975, years before we had developed functional containment procedures for it, and… after that, he sought us out. He never said much about it, but you could tell. If that's him in there, and he had found a way to remove every trace of the anomalous from our universe, no matter the cost, he would do it. I know he would do it. I can hear it in his voice. On January 11th, 2007, after further discussion with SCP-001 and additional independent research, the Overseer Council voted 8-4-1 to initiate a power-down of the Spatial Stabilization Array and allow SCP-001 to take the action it had described. Three Overseers (O5-1, O5-4, and O5-12) were in attendance. As a sign of good faith, an anomalous artifact (SCP-884) was selected and SCP-001 was directed to target the reality in which the artifact had originated. O5-3 oversaw the artifact during this process. 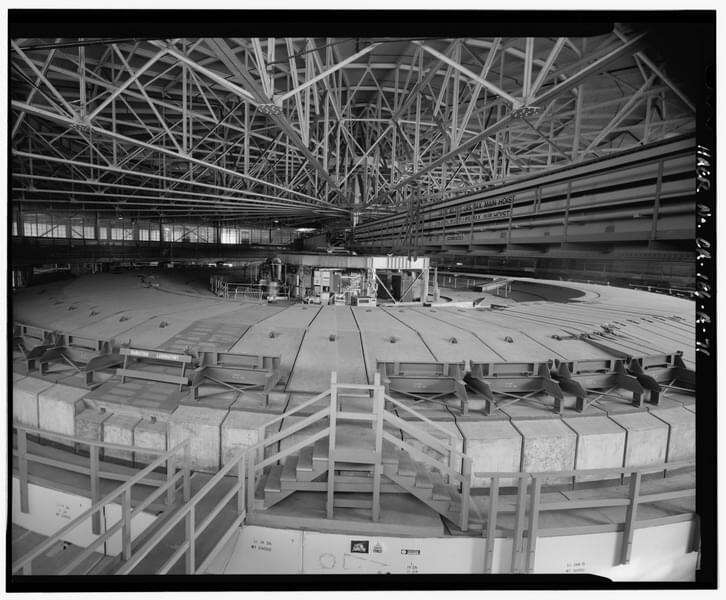 O5-1, -4, and -12 stand alone in the Stabilization Array's control center. Visible on another screen is the dark cloud of gas and dust encircling SCP-001. O5-4 has a telephone in their right hand. They nod to O5-1. O5-1: We're going to begin to step down the power running into the array. When we reach the agreed upon point, we'll hold it there until you can prove to us you can do what you claim. Do you understand? O5-1 initiates step down procedure. NETZACH cycles down reactors 2 and 3. The cloud of radioactive dust and debris encircling SCP-001 falls into the borehole below it. Visible now as the light from the array is warped around it is a jet black humanoid entity. The entity does not move. O5-1: This is it. Can you see me? SCP-001: I can see everything. O5-1: Do you know what you're looking for? SCP-001 does not seem to respond initially. Its position in the center of the array does not change. SCP-001: The world I see is not unlike your own. In that world, a dying soul attached itself to that mirror; a curse to whoever should own it. (Pauses) It has happened. There is a moment of silence, until O5-3 is heard over the radio. O5-3: It's gone. It was sitting right here on the table, and then it just… it's like it folded in on itself until it was gone. There's nothing left. O5-1: (To SCP-001) Was that you? SCP-001: That narrative has ended. O5-1: How long will it take? O5-1: Will it hurt them? SCP-001: It will be agony. The space around SCP-001 within the array begins to shimmer. Low, loud pulses of noise are emitted from the air around them, and the light within the chamber begins to bend in towards SCP-001. The array creaks and groans under the stress. O5-4 and O5-12 step away from the observation window. O5-1 does not move. The building around them begins to shake. Points in the air around SCP-001 begin to distort, as if being dragged down individually towards SCP-001. The room darkens. More low pulses begin to rise up out of the borehole. A single, thin ring of white-hot debris begins to form around SCP-001. Others join it. Nearby, a klaxon can be heard as NETZACH warns of intolerable load on the array. O5-1: Does it hurt you? Suddenly, O5-1 jerks backwards. The space around his body begins to distort, as if being pulled in towards his center. He reaches forwards towards the observation window, his body compressing unnaturally. SCP-001: (In O5-1's voice) If that's him in there, and he had found a way to remove every trace of the anomalous from our universe, no matter the cost, he would do it. SCP-001: (In its own voice) Your children free to live lives that do not end in horror. An end to your perpetual struggle. An end to darkness. The freedom to live in the light. All traces must be removed. (In O5-1's voice) …every trace of the anomalous from our universe. (In its own voice) This world must be washed clean. It is the only way out. O5-1 collapses in on himself, folding and distorting down into a single point that hangs in the air for a moment, and then disappears. All around the chamber, the walls begin to bend and distort. The air shimmers. O5-4 is lifted into the air, screaming, as her body begins to fold in on itself. Her eyes bulge and her bones audibly shatter. Another wave of force is emitted from within the stabilization array, and the observation window shatters. SCP-001 turns to look up at O5-4, who instantly crumples into a single point and then disappears. O5-12 stands to flee, but is seemingly frozen in fear. There is a loud grinding sound, and then O5-12 falls to the ground. From within the containment chamber, a loud hum is heard that grows considerably louder. SCP-001 is observed for a moment more staring up at the observation deck, before it is surrounded by a cloud of dust and debris. As the array settles into position, the low pulsing sound dissipates and all that can be heard is the sound of NETZACH's warning klaxon, signalling that it has activated an emergency failsafe. O5-12 is heard sobbing in an unseen corner of the observation deck. SCP-001's voice begins to grind through the metal rings of the stabilization array. SCP-001: (A dull, grinding roar) Your children free to live lives that do not end in horror. An end to your perpetual struggle. An end to darkness. The freedom to live in the light. All traces must be removed. This world must be washed clean. The Foundation does not escape atonement. It is the only way out. In the event that SCP-001 breaches containment, the Tredecim protocol is designed to provide an extradimensional escape route for all high-ranking Foundation personnel to avoid annihilation at the hand of SCP-001. We were wrong. Tredecim is no longer an option. Every alternative must be considered. Sustained containment of SCP-001 is now the Foundation's only objective. More information will come to you as I receive it. 3. In the original Arabic, "Perdition". 4. Other technologies, such as reality anchors, are ineffective. 5. And including notable Foundation researchers Dr. Isaiah Herrimann, Dr. William Bell, Dr. Simon Pietrykau, Dr. Ernest Duke, Dr. Tilda Moose, Dr. Gina Lazenby, and Dr. Carter Lament. 6. Specifically those that warp spacetime due to their immense or fluctuating density. 7. The reason for this is still unknown. 8. The first autonomous system, VIRTUS, was installed in November of 1989. 9. NETZACH, a next generation artificially intelligent system manufactured by the Foundation's advanced Rosenworks Labs, is a complex creative machine built to handle not only the specific high-level mathematical challenges involved in the stabilization array, but also address any potential unknown complications involved in this process. Unlike previous Foundation artificial intelligences, NETZACH cannot communicate casually, as it does not have a functional personality complex. 10. Currently, this is believed to be the outer limit of SCP-001's influence, as the rest of its abilities are mitigated and contained by the stabilization array.